The constellation Virgo. Roll mouse over to see labels. Virgo is the second largest of all the constellations, lying on the celestial equator. It appears highest in the evening sky in the months around April. It is one of the twelve zodiacal constellations, and the Sun passes through it each year between mid-September and the end of October. This includes the moment when the Sun passes southward across the equator at the September equinox. In Greek mythology, Virgo is often identified as Dike, goddess of justice, who was the daughter of Zeus and Themis. She is often depicted holding the scales of justice, represented by the neighboring constellation Libra. Together with neighboring Coma Berenices, Virgo is home to the brightest cluster of galaxies in the sky, the Virgo Cluster, which comprises well over 1,000 galaxies. Among these are eleven galaxies with Messier designations. The Virgo Cluster forms the core of an even larger structure, the Virgo Supercluster, of which the Local Group of galaxies, including the Milky Way, is an outlying member. 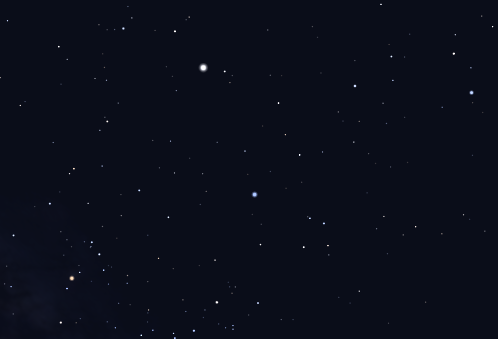 Virgo contains the following Messier objects: M49, M58, M59, M60, M61, M84, M86, M87, M89, M90, M104. Virgo contains the following Caldwell object: C52. 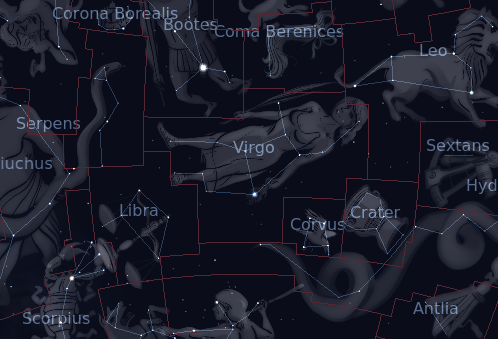 The following constellations neighbor Virgo: Bootes, Coma Berenices, Corvus, Crater, Hydra, Leo, Libra, Serpens Caput.